Board of Supervisors has a new page!! We have a new page with all of the Board of Supervisor's Video!! This is an old link and you have landed on an outdated page. The new page is Here! San Andreas, CA This meeting runs about 1 1/2 hours including a study session on Legal Access requirments to parcels in the county before building permits will be issued. There are also some very interesting comments from Sheriff Downum & additional parties on the "New Jail" issue. We have Sheriff Downum's comments in a seperate 256k Clip. We have the meeting in WMV 256k & 56k streams. 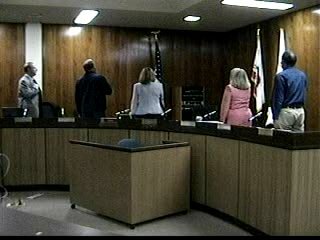 (San Andreas) The Board of Supervisors for 6/19/06 was a busy one. There were weighty discussions & decisions on lots of issues today. Some of the items on the agenda included Child Care services for the Welfare to work program, Bio-Terrorism and disaster preparedness, case management software for the probation dept. and discussion on establishing a Help America Vote Act (HAVA) designated fund. The new CDF Chief Michael Noonan was also introduced. The full agenda is Here and an addendum is Here! If you want to follow along. The meeting is available in WMV Dial Up and Broadband here. (San Andreas) They discussed a range of topics during this meeting but the ones that jumped to the forefront were that there may be quite a few people unhappy with the state of ambulance services in parts of the county and the Girl Scout Awards. We have the meeting ready for streaming in Windows Media Broadband & Dial Up. The agenda is enclosed if you want to follow the play by play. 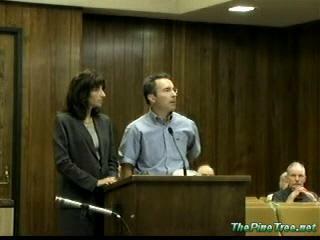 (San Andreas) We have the Board of Supervisors Meeting for 5/15/06 ready for video streaming. Some of the hot topics include: Cal Works will be getting free office space from Mark Twain St. Josephs in their clinics to set up shop for one day per week in Copperopolis. If this works out well this program will be expanded to other clinics including Angels Camp & Arnold. Castle & Cook, & other interested parties lobbied for a yes vote to have work on the Copper Plan completed. Zoning & Parcel issues for District 2....& various additional county business. Window Media clips in Broadband & Dial Up are available. 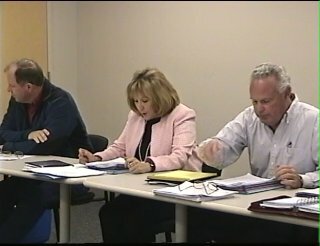 The Board's meeting for 5/8/06 is available now. 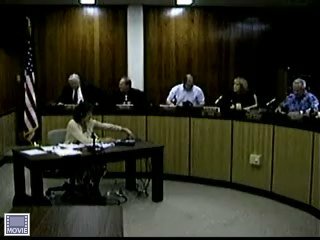 The Board's meeting for 5/8/06 is available now. We have the usual Dial Up & Broadband Versions. If you click on the image below the Broadband verison will launch. If you want to follow the action and call the play by play...the agenda is Here! 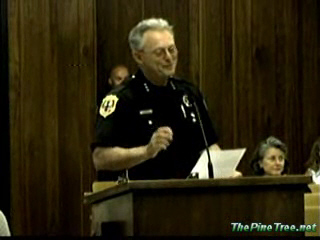 Streaming Video of the 5/1/06 Board of Supervisors meeting is Online Now! 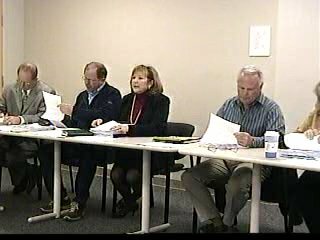 Video of the 5/1/06 Board Meeting is available now. You can steam at Broadband or Dial Up speeds. 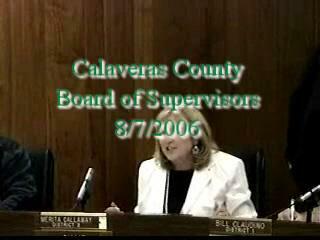 The 4/24/06 Board of Supervisors Show is now Online! Monday's Board meeting is available in Broadband & Dial Up versions. If you want to follow the action the agenda is Here! Topics discussed included Payroll Software, Baby Stroller Safety & the usual county business. One of the most illustrative topics was Supervisor Tryon's report on the Rural Council of Rural Counties & flood plain issues & county liability issues. Supervisor Chair Callaway also mentioned that electric rates will be going down 1/2cent per kw for CCPA members. The latest board meeting is available for your viewing pleasure. We are switching back to the Windows Media format as some of you have had trouble steaming the files. If you are on a Apple, the Windows Media plug-in for Quicktime is available for download Here! BOS 4/17/06 Broadband, BOS 4/17/06 Dial UP. These files work best with Internet Explorer. Firefox sometimes has some issues autostarting the files. The files play but only after it has pulled the entire file into cache. The March 27 Board of Supervisors Meeting is Available for Broadband & Dial Up. This meeting covers county administered medical marijuana cards & various zoning issues. General Plan Study Session is now online! This is an over 3 hour session. You can launch the file Here! If you are a developer, builder or someone that needs to review several different sections you might want to download the file instead of just streaming it. These files work very well with Internet Explorer. If you are using Firefox as we do on some machines the file sometimes has problems autostarting. If you are on an Apple Computer there is a Quicktime plugin available from Microsoft to play WMV files in QT. 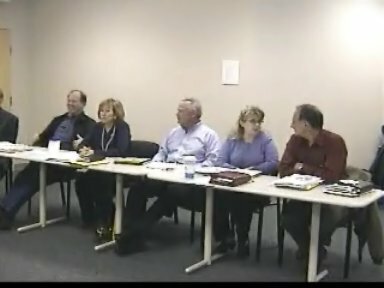 The 3/20/06 Board of Supervisor Meeting is available for streaming or download! The Broadband version is Here! The Dial Up version is Here! The board meeting for March 13, 2006 suitable for Dial Up connections is online Here! We will be posting the broadband version later today. Yesterday's Meeting is available for streaming online in Dial Up format Here! The broadband version is available for download Here! This is a Real Player file. We have tried several different codecs and this one has the best balance of size and quality. Several different news organizations such as Fox news are using this format. There are versions of this player for both Windows & Macintosh. 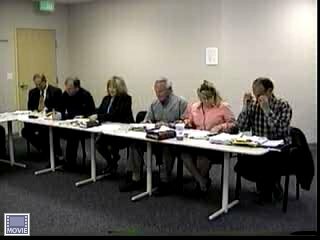 The Board of Supervisors meeting for 2/27/06 is online Here This is a dial up quality Windows Media format file. As soon as the Board is back in their normal meeting room we will be posting a broadband version as well. We will also be posting Apple Quicktime versions for you Mac users out there. San Andreas, CA The Calaveras County Board of Supervisors for 8/7/06 is ready for streaming. There are several interesting items discussed in this meeting. Liquor Licenses, West Nile, The Chamber of Commerce Booth at the State Fair & more. We have the Dial Up version up now and we will be adding the Broadband version later. Just click on the pictures below to start the 56k version.